How to buy a grill and what kind of grill or BBQ should I buy is a question we run into a lot. Reason for us to write a post on how to choose the right grill that fits your family size, your way of cooking and grilling and your budget. 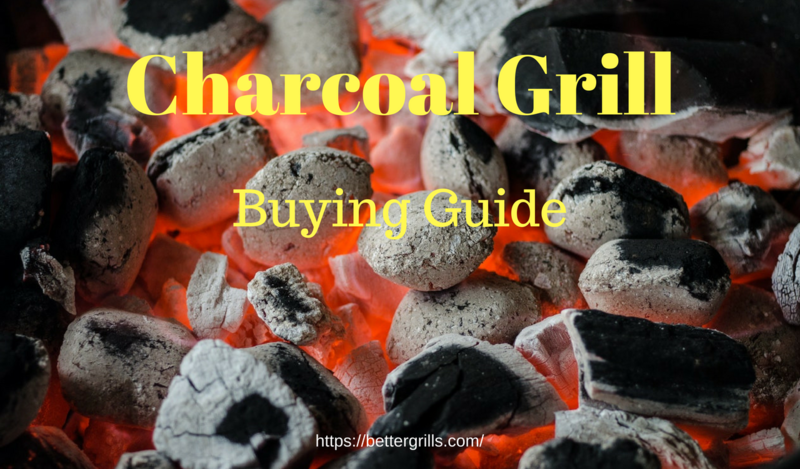 We will answer all questions about choosing a natural gas, propane gas, electric grill or a charcoal grill in this grill buying guide. 2. Gas, Charcoal or Electric? There are two important things to decide first before you can even start looking at grill brands or models. We will provide you with all you need to know and what to look for when buying a BBQ grill. It is very important that you know how to choose the right grill size. There is a rule of thumb that you need about 72 square inches for each person. With the average household, according to https://www.statista.com/, being 2.54 people that would suggest that 226 sq inches would fit your needs. Unfortunately it is not as easy as that. You have to take in consideration what you are planning on doing with your grill. The 72 square inches are meat and other food like vegetables. If you are just looking for a grill to cook some burgers the only question you need to answer is “how many burgers fit on a grill” But it is better to look at the other way. How many burgers am I going to grill most of the time and then decide the grill size you need. A basis BBQ grill size calculator could look like: Persons to cook for X 72 square inches = grill size you need. Roughly this is the size of an average dinner plate per person to make it easier. One other thing to keep in mind is how much room you have between the grill grate and the inside of the lid. If you are looking for room to smoke a turkey or make beer can chicken you need at least 12 inch room there. TIP! Before you do anything else, make sure you know how much grill surface you need! Depending on your preference you can buy a square, rectangle or round grill. Calculating the surface for a square and rectangle grill is done by multiplying the length and the width. This will give you the square inches. A round grill is a little harder. You need to a formula that goes like this: (diameter x diameter) X 3.14 – divide this by 4 = total square inches. You can have a look at this calculator and let it do the work for you. https://www.calcunation.com/calculator/circle-area.php. Alright that was the first important step, finding the right size grill. Now we have to find out what type of fuel you like to use. There are basically 7 types of fuel that are used to fire up a grill. All have there pros and cons and (according the experts) give their own flavor to the food you cook. Let’s have a look at the pros and cons of these 7 fuels for firing up a grill. There are two types of charcoal for grilling. These are the most used. They burn with a consistent temperature and are widely available. One of the most know brands is Kingsford that can be bought in most stores. I usually by it here for a better price and get it delivered to my door. This one is gaining in popularity because it does not contain any chemicals or other type of fillers in general. In my experience they burn hotter than the briquettes. Lump charcoal is a little harder to find that is why I order them online in this store. Starting charcoal grill can be done in several ways. you can buy the self start charcoal. I don’t advise this because it contains chemicals that might get in the food you are grilling also. The same problem I see with the charcoal starter blocks that you can use. My preferred way of starting a charcoal grill is to use a charcoal chimney starter. The second way is to use one of the electric charcoal starter we reviewed here. Pros and Cons of Natural and Propane Gas for GrillsBoth types of gas have in my opinion the same type of pros and cons. 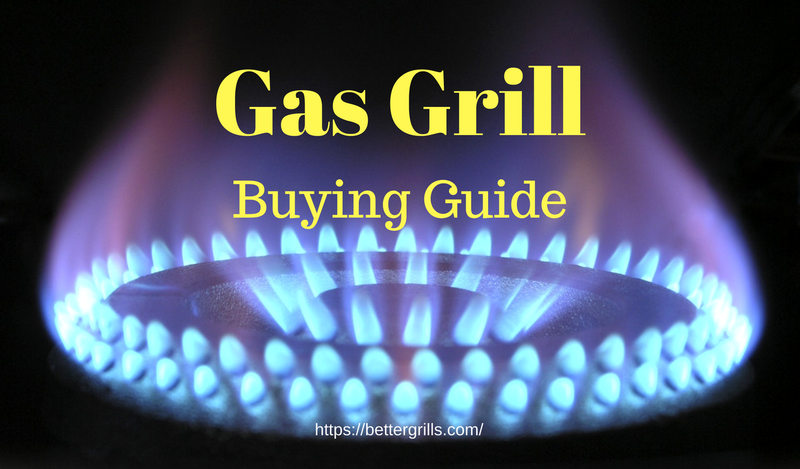 If you need to more about how to buy the best gas grill you can Click here on this link to read my how to buy a gas grill guide. Propane is the most used form of fuel for a gas grill. Reason is that is widely available, although certain stores only sell one brand. Most dollar stores, gas stations or convenience store sell the larger tanks. It is a little hard to see how much propane is left and if you don’t have a spare tank available you can run out of gas in the middle of a cook session. There are ways to see how much gas is left and you can read an article I wrote how to see how much gas is left in your tank here. Wood is the oldest form of fuel that is used for grilling. Way before we had grills it was used for cooking. Charcoal is made from wood that is burned and than cooled of. Most people use wood to give their meat a smoked flavor and if it is used by itself most of the time it in a smoker in the side firebox. If you like to read more on how to use wood-chips for smoking you can read this post I wrote. Wood pellets are mostly used in pellet grills and smokers. They are wood dust and milled wood that are pressed to pellets. Wood pellet grills feed these pellets in the grill to maintain a steady temperature. This post is about choosing the right grill, but you can read more about pellet grills in the reviews we did here. For many years electricity was only used to power the countertop indoor grills we reviewed here. But many brands starting to realize that customers lived in an apartment building or other living situation where the use of charcoal or gas grills was not allowed. They started building electric grills for outdoor that in many case come close to how any other outdoor grill performs. For an electric grill it is my opinion very important to read all about the model you have in mind because there are good and bad grills on the market. If you are interested you can find many electric outdoor grills we reviewed here. Electric grills are getting better and better. Heating it up might need you to cycle it of and on a few times to get the heat evenly distributed over the grill surface. They use electricity and some people think this is expensive but it is not. If you look at the average Kilowatt price in the US being 12 cents and an electric grill in many case is 2 kilowatt (2000 watts) That means that using an electric grill with these numbers would cost you about 2 x 12 cent is 24 cents/hour. Compared to charcoal it makes an electric grill a little cheaper to use. There are more things to take in consideration than just the size and what type of fuel when you look for the best grill. Charcoal grills have different needs than a propane grill. It is impossible to have a one size fits all view when you are looking to buy a grill. A charcoal grill can be a simple and cheap grill that you can use for grilling a burger, some chicken or a hot dog. By looking a little deeper you can use a charcoal grill for many other types of grilling and even for smoking on a low temperature. Indirect grilling: if you can make two zones in your grill you can use the hot zone for searing and the colder zone to finish of the meat. This requires just a little larger grill than the 20 dollar cheap charcoal grills. Many people use the Weber Kettle grill and cook all types of meat on it. Although this is still a smaller grill it can be used to setup the charcoal on one side and in this way cook indirect. Indirect cooking will give you so many more option to use your charcoal grill and I highly recommend to thinks about that when you are looking for charcoal grill. Smoking on charcoal grill: This is a little harder to do but not impossible. I have a small barrel grill and by putting a small amount of charcoal on one side I am able to smoke all types of meat. What I am trying to say is that with a little larger charcoal grill you have more possibilities. It does not require an expensive smoker to cook some great pulled pork or slow cooked pork chops or chicken. Pizza on a charcoal grill:Have you ever tasted a pizza that was cooked on a grill? This is just one of the accessories you can use on your grill. With a simple but versatile kettle grill you can add this kettle pizza kit and cook some great home made pizzas. I hope you see now that choosing a charcoal grill is easy but finding the one you really like takes looking a little more. like I mentioned earlier the only difference between a natural gas and a propane gas grill is the difference in gas. Like a diesel and gas motor in a car. Some grills can be converted from propane to natural gas but most of them are just made for one type of gas. just like I mentioned in the charcoal grill section it is a great benefit to have the option to use the grill with indirect grilling. Meaning a hot side for searing and a cooler side for finishing the cooking process. To accomplish indirect grilling your gas grill needs at least two burners. There are many accessories available for propane grills but they depend on the size and brand or even model of the grill you buy. Some grills come equipped with side burners, side tables or storage under the grill to keep your propane tank out of side. What are BTU’s is one of the questions I regularly find.BTU stands for British Thermal Unit and is an indication how much propane it uses. For example a 30.000 BTU grill will use 30.00 BTU per hour and that is roughly 2 pounds of liquid propane gas. Where to get gas for your grill is one of the other questions we see a lot. I personally have bought propane gas at hardware stores, my local dollar store and even at gas stations. I use the large tanks that can be changed out after you empty it. My tip is to spend money on a spare propane gas tank to avoid the Murphy’s law of running out of gas while you are in the middle of a grill session. If you like you can read my extended post on how to buy a gas grill here. I have written almost 2100 words now and I can easily add another 2000 because there is so much to write when it comes to choosing the right grill. Here I will tell you how I use my Charcoal and my Propane gas grill and maybe it will help you find your ideal and perfect grill. Although I believe after grilling for many years that the perfect grill does no exist. I have a Barrel charcoal grill that I bought in 2006 and still use for mainly slow and low cooking of pulled pork. I also use it for indirect grilling of chicken, turkey, pork chops and many other dishes. Every year I clean it very good and use some black heat resistant paint to paint it again. It still looks great after all these years. I have a Char Broil Grill2go infrared grill that I use for grilling burgers, hotdogs and other meat that you can cook on high heat. I also use this to take with us to the beach or camping trips or a pick-nick in the park. Those two grills have cost me around 275 dollar and have served me for many years now. I can basically cook anything I like on either one of them. The only thing I am planning of adding to my barrel grill is a side firebox so I can use the full size of the grill and not just the half I am using now because of the indirect method I use. 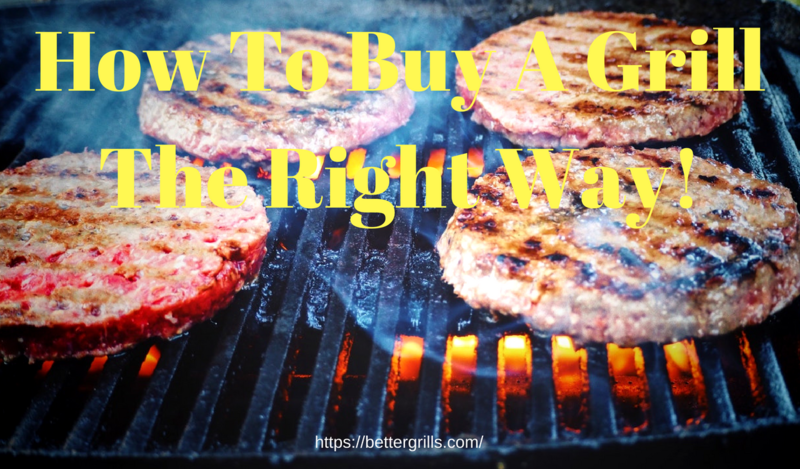 I hope that my story in this how to buy a grill article will help you find the grill you need and the one that will fit your needs and your family size. There is one tips I would like to share and that is to use a quality grill cover to protect your grill from the elements. Even if you store it in your shed or garage. You can find your grill cover here in the reviews. For more tips about grill, BBQ or smoking you can click here. PS: You can find many outdoor grill reviews and our rating here in this category to help you. Feel free to contact me with any question you have. PPS: Give me a like or share on your Facebook page if you liked this post.